The name ‘Fryup’ is thought be derived from ‘friga’ an old English personal name and ‘up’ or ‘hop’ meaning valley. Twelve thousand years ago Little and Great Fryupdale were part of a glacial lake, but now as you can see it is a patchwork of walls and hedges with a few farms and houses dotted here and there. A stream runs through the bottom of the dale called Fryup Beck which is a tributary of the River Esk. 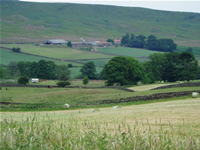 There is no village in Little Fryup, Danby is the nearest village which is 2.5 miles away. About one mile north of Crossley Side Farm stands Danby Castle ruins and Farmhouse which was built in the 14th Century as a defensive tower by the Latimers. A more famous occupant is said to have been Catherine Parr, Henry VIII’s sixth and last wife. Below Danby Castle is an old packhorse bridge which dates back to about 1386. It was repaired in 1715 by a chap called George Duck, which is where it gets its name today ‘Duck Bridge’. The surrounding moorland is famous for Grouse and the heather, which is at its best around mid-August. Crossley Side Farm is situated in Little Fryupdale, said to be the shortest side of the dales of the Esk Valley and definitely the most picturesque! The view from the head of the Dale is stunning and often seen on calendars, on NYM National Park displays and also on “The Royal” TV programme. Historically, the moorland plateaux to the west of the Dale supported a thriving Bronze Age community some 4,000 years ago. Reminders of their existence are: standing stones, an impressive cross-rig double dyke system for defence, a stone circle and burial mounds – contents of one can be seen in Whitby Museum. At that time the Dale would be heavily forested with treacherous bogs and marshland along the valley floor. Certainly wolves, wild boar and other animals would be plentiful. 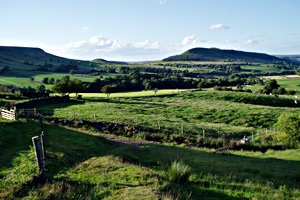 At the time of the Norman Conquest, Little Fryup was part of the Manor of Danby which was allotted by William to Hugh Fitz Baldric then later to Robert de Brus – grandfather of Robert the Bruce of Scotland. 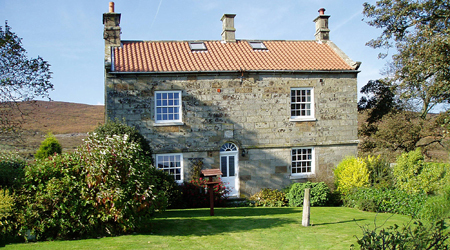 The de Brus family held the Manor of Danby for almost 200 years, building and living in their castle in Castleton. The Fryup Dales were referred to in old records as the “forest of Fryca”, it was a favourite hunting ground for the Lords of the Manor. “Fryca” probably derives from the Norse name; became Frycoe then Fryop before Fryup. Although strip farming was practiced in Saxon and Norman times, it was usually near to the Lord’s residence. Later, tenants were allowed to cultivate suitable areas and keep livestock and build shelters for themselves and their cattle which would be made of mud and wattle. 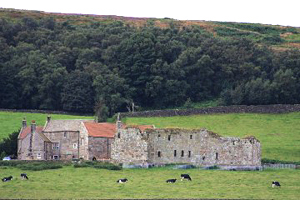 Crossley Side Farm probably came into existence in the 14th century when much forest was cleared, the best oak trees being used in building the new castle in Danby. The farm house would then be poor, low hovel built with anything available – rough stones gathered from the land, tree branches, heather and bracken. The farm would be the first one in the Dale with the east side of the valley remaining in forest for much longer. In the 15th century the Manor came into the ownership of the well known Neville family who made many improvements to Danby Castle and probably helped the tenants to build better farmhouses. The method at the time was the erection of cruck or crook houses. The crucks were made from oak trees with natural bend. Each piece would be about 20 feet long and was adzed to roughly 18 inches by 8 inches. A pair were joined at one end with the other ends splayed out to the width of the house with the bends outwards. The splayed ends rested on flag stones at ground level to form big A frames. The A frames were erected at 12 feet intervals and joined with heavy purlins above to support a thatched roof. The sides and ends were filled in with rough stonework often using soil or clay to fill caps. Cattle shared the same building in winter. Although these crook houses were a great improvement, they were unhealthy and a high fire risk. The next improvement came in the 17th century in the form of the long house with the farm house of two stories at one end joined to single story live stock quarters. The walls were built of quarried stone using lime mortar and supported the thatched roof – later replaced with pan tiles. These long houses were quite good and many were incorporated into the next rebuilding – at Crossley Side Farm (note the date over the back door). The 18th and 19th centuries saw large scale rebuilding of farmhouses because of more prosperity in farming and availability of cheap labour. Farmers needed bigger houses for their own, often large, families and to house hired workers. The large, well built farmhouses we see today were built during this period, often retaining some of the earlier house. Strict segregation was insisted between family and workers with separate staircases – the worker’s stairs usually leading to the attics. The rebuilding of Crossley Side Farm was unlike most farmhouse rebuilding in that the new house was built on to the side of the old one. Mostly, if any of the old house was retained, it was on the end of the new, acting as a kitchen or outbuilding. The reason for this may be that the old house was particularly well built at Crossley. Modern services came late to farms in the Dale. Piped water arrived in the 1930’s rendered the well in the garden redundant. Mains electricity came in the 1950’s when paraffin lamps and candles were abandoned.